While you couldn’t pay me any amount of money on a normal day to go anywhere near Times Square, aka the neon wasteland colonized by wandering droves of tourists, Applebee’s is hoping the lure of the New Year’s Eve ball drop will entice diners to actually pay to venture to the area on its most crowded night. A whopping $375, to be exact. Yes, you read that right: You can pay almost $400 for a dinner at Applebee’s, where a full meal can sometimes cost a paltry $10, served with a side of flair. 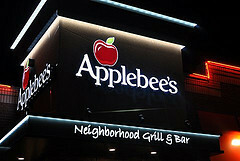 Two of the chain’s franchises in the Times Square area are hosting what Applebee’s calls “a night to remember” in this year’s annual offering, reports MarketWatch. That hefty chunk of change covers four hours of partying with a buffet, an open bar (darn straight that bar better be open for $375), a DJ and food made by “some fairly sophisticated culinary people,” says the head of the New York area’s 38 restaurants. But of course, all that is basically just extras. The real show will be the big ball drop at midnight, as well as watching through the windows as spectators try to figure out how to urinate into empty water bottles instead of trying to wiggle out of the morass. While sure, it’d be nice to be able to sit down on a chair instead of squatting in the street until your feet lose all feeling, the reality is still paying $375 for a meal at Applebee’s. So is it worth it to be so close to the action?